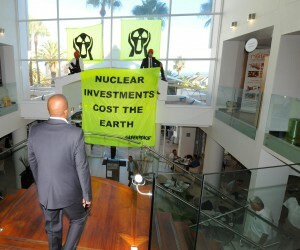 Greenpeace activists today protested at the opening of the two-day long ‘2nd Nuclear Industry Congress Africa 2015’, demanding a halt to shortsighted nuclear plans and the prioritisation of renewable energy investments amid South Africa’s energy crisis. 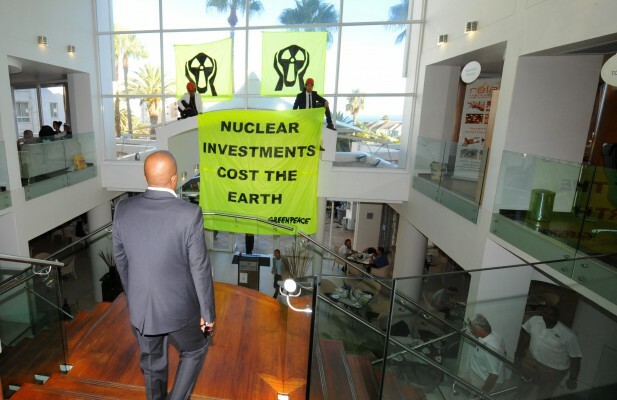 As a direct communication to the delegates, the activists disrupted the opening of the congress and unfurled a banner inside the meeting venue that read ‘nuclear investments cost the earth’. “Greenpeace believes that controversial plans for new nuclear investments are not a solution to this country’s crushing electricity crisis. In fact, nuclear projects are a distraction from the real solution to the crisis: investments in renewable energy solutions. It would take at least 15 years for new nuclear projects to deliver electricity to the grid, which is far too little, far too late and comes at far too high a price. South Africans cannot afford to wait for another 15 – 20 years for nuclear projects to come online, when renewable energy investments can immediately resolve the country’s urgent energy problems”" said Melita Steele, Senior Climate and Energy Campaign Manager for Greenpeace Africa. “The State of the Nation address this evening is the perfect opportunity for President Zuma to announce that South Africa is abandoning the current nuclear expansion plans, and is instead actively removing the barriers to renewable energy sources, which are reliable, and can immediately take South Africa out of this electricity crisis” added Steele. In March 2011, barely a week after the Fukushima nuclear disaster in Japan, the South African government announced its plans for six fold nuclear expansion, when countries around the world were taking stock and seriously reconsidering nuclear investments. The full human and environmental costs of the Fukushima nuclear disaster are yet to be tallied, but over 140 000 people had to be evacuated and nearly four years later are still seeking compensation. Meanwhile, South Africa’s nuclear build plans have so far been plagued by secrecy, controversy and serious irregularities. “The reality is that the current nuclear plan is nothing more than a dead end, and if this country continues to pursue these controversial nuclear expansion plans, it is the South African public who will end up paying the price. New nuclear projects are likely cost up to R1 trillion, which would bankrupt this country and force skyrocketing electricity prices, while at the same time failing to deliver on the electricity that South Africa needstoday,” continued Steele. Government’s prioritization of nuclear energy combined with massive investments in new coal power stations, which have consistently failed to deliver on time and on budget, shows that there is an urgent need for an energy overhaul to solve South Africa’s energy woes.